Monday, Mar. 5 head out to the quad to be a part of a message of support to an English family recently affected by an explosion. Bloomsburg University students organized the event after learning that a BU international classmate had a close friend severely affected by a recent explosion in Leicester, England. A support video will be created with the use of a drone on the quad so that it may be shared with the victims. The students are also seeking support for the victims’ Go Fund Me page. The students organizing this event are asking that any BU student available to please come to the quad at 12:45 p.m. to be a part of the video that will share support for a grieving family across the ocean. 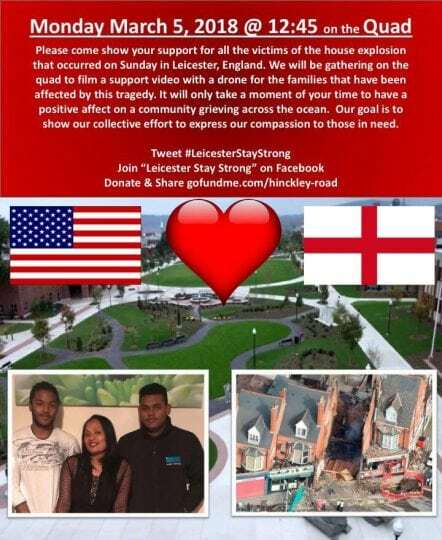 They are also asking students to join the “Leicester Stay Strong” Facebook page as well s use the hashtag, #LeicesterStayStrong.